Virtual Reality Learning: Ready for Prime Time? If you are anything like me, you keep a sharp eye on emerging technologies with the potential to improve your learner experience. And virtual reality learning has been on my radar for quite a while. So, when I was given the opportunity to experience the LearnBrite VR Scenario platform first hand, I jumped on it! 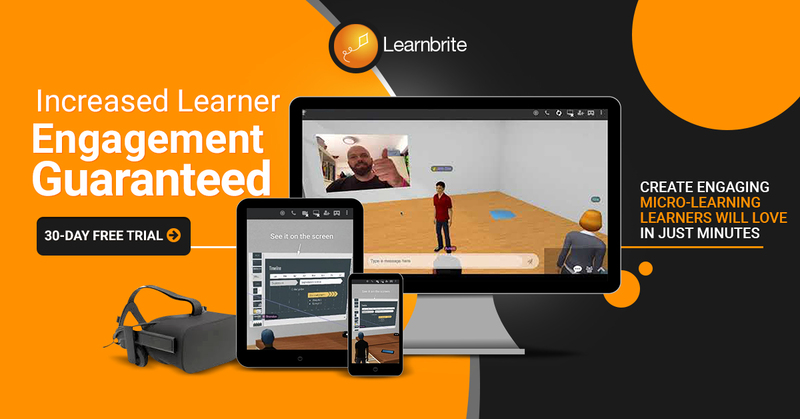 In this post, I provide an overview of building a virtual reality learning experience with LearnBrite, and share some thoughts on the process from a traditional e-learning perspective. LearnBrite has developed several virtual reality tools specifically for the e-learning industry. They have three main offerings: VR Workplace for meetings and webinars, VR Campus for collaborative learning experiences, and VR Scenario which is what I used to create my virtual reality learning experience. VR Scenario is a collection of tools that allow you to create engaging and immersive learning experiences. The end product is HTML5, so the experience can be accessed from any browser or mobile device with or without a VR headset. You can even package as SCORM; embed into Captivate or Storyline; or prep for LTI. 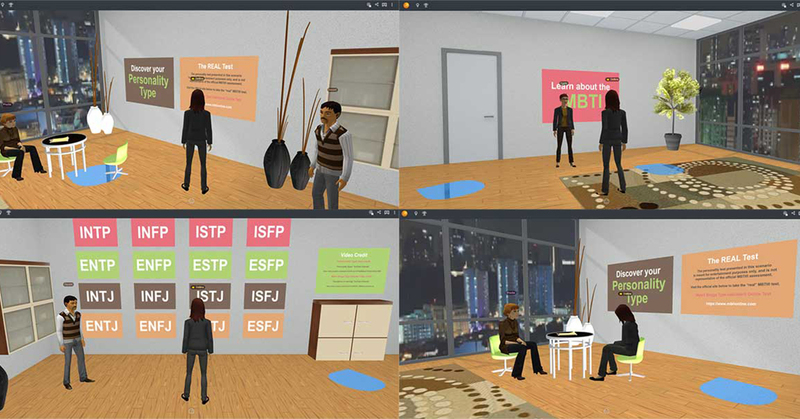 For my demo, I created a scenario where players take an interactive personality test, explore their resulting personality type, and learn more about the test and the other personality types. A Space can be any conceivable virtual space: an office, an auditorium, a café, a hospital, the outdoors, etc. LearnBrite offers 15+ customizable templates to get you started, or you can upload your own 3D model to use as your space. Items are objects within a space, and can be any 3D object in the right format. LearnBrite has a library of items to choose from, or you can upload your own. There are entire libraries of 3D objects (and spaces) on sites like Google Poly Blocks, Sketchfab, and 3D Warehouse or pretty much any open standards 3D object repository you can find. I chose to customize the office template for my space, and populate it with furniture and other items to make it feel like a counselor’s office. 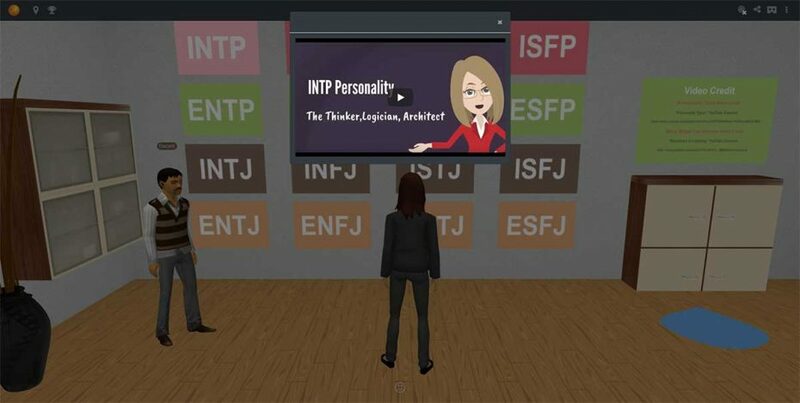 I then added media boards to feature videos about each personality type. Media boards are items used to feature any type of multimedia, and can also be used for real-time screen sharing. Actors are 3D “bots” that can help guide players through a virtual reality learning experience, or play more interactive roles, such as patients, coworkers, or customers. Actors are created using the UniversalAvatars platform. 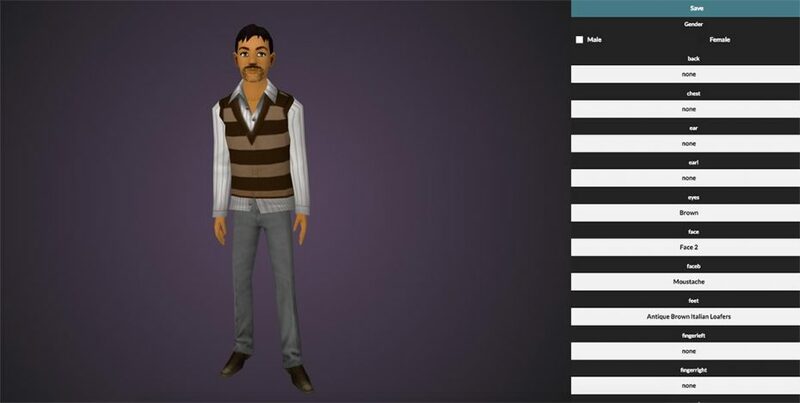 With Universal Avatars, you have endless ways to customize your actors. 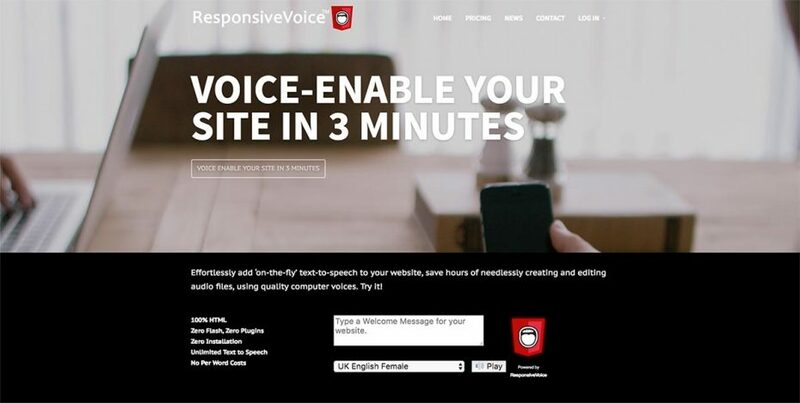 Actor voices and language are defined using ResponsiveVoice, or you can use your own voice over files. Actor gestures – like waving, smiling, or thinking – can be added from a scenario. I kept my actors fairly conservative, since my space is a professional setting; but you can get as creative as you like with your avatars. Hotspots determine how actors and players move around in a space. Hotspots can be created in spaces, but are mostly controlled from scenarios. Achievements are the main gamification feature in LearnBrite. Achievements can be awarded for starting or completing tasks like engaging in a conversation, answering a question, watching a video, or collecting an item. 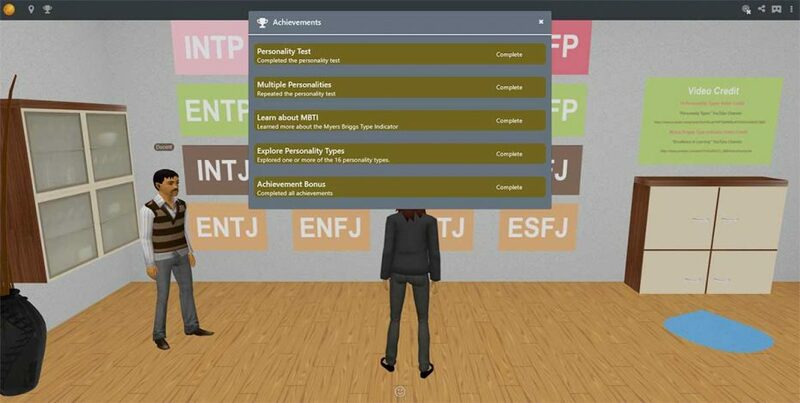 I created achievements for taking the personality test, completing the test multiple times, watching videos, and for completing all achievements. 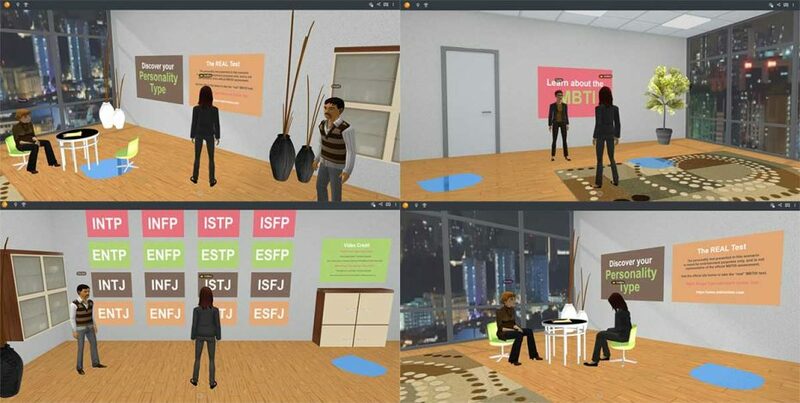 The scenario is the backbone of a virtual reality learning experience in LearnBrite. Almost everything that happens within a space is directed by its associated scenario. LearnBrite scenarios are built using ChatMapper. 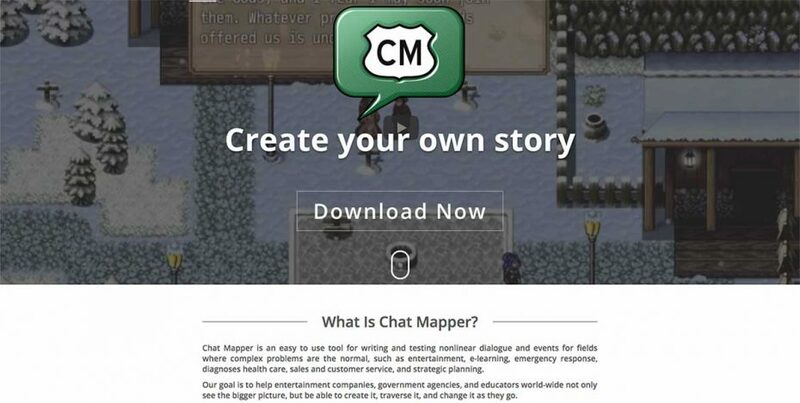 ChatMapper is a “Nonlinear Dialogue and Scenario Editor” and it does exactly what its definition implies. It gives you the ability to create a branching dialogue situation with almost endless possibilities at your disposal for increasing interactivity, user agency and of course learner engagement. A Chat Mapper scenario contains the dialogue between actors and players, as well as conditions and scripts that allow you to create dynamic interactions between the characters. This results in an engaging learning experience with many possible outcomes. Here is a link to the Personality Assessment Training demo I created. While I did experience a bit of a learning curve with ChatMapper, I found my greatest challenge was learning to write effectively for a 3D environment. I needed to make a shift from linear to non-linear thinking. There is a lot more to keep track of when writing for an immersive experience. In addition to writing the dialogue, you need to account for how players interact with actors, objects, and the space itself. How do your actors and players move around in your space? Does a conversation need to change after the first encounter with an actor? What happens at the end of a conversation? Is the player left to explore, are they given choices, or are they transported somewhere else? The key was to produce a script that allowed for the overall experience, not just the dialogue within it. While creating my demo, I kept thinking of ways the VR Scenario platform could simplify contemporary e-learning challenges. 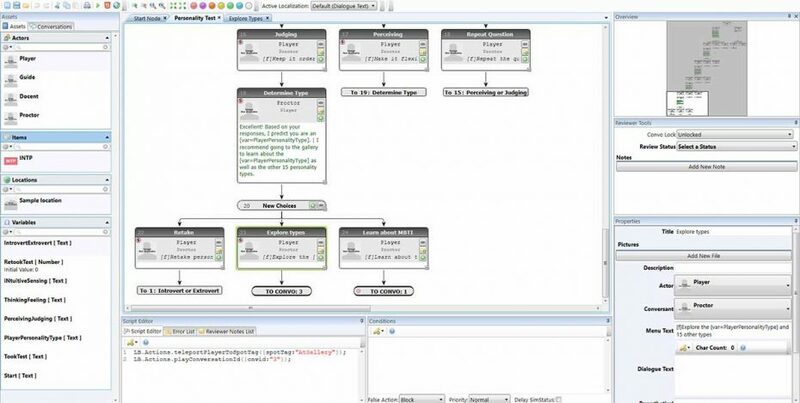 Creating branching scenarios can be a tedious process using traditional e-learning software. Yet this feature flows naturally in VR Scenario. Role-playing scenarios that rely on branching like customer service, gender sensitivity, and sales are a good fit for virtual reality platforms. 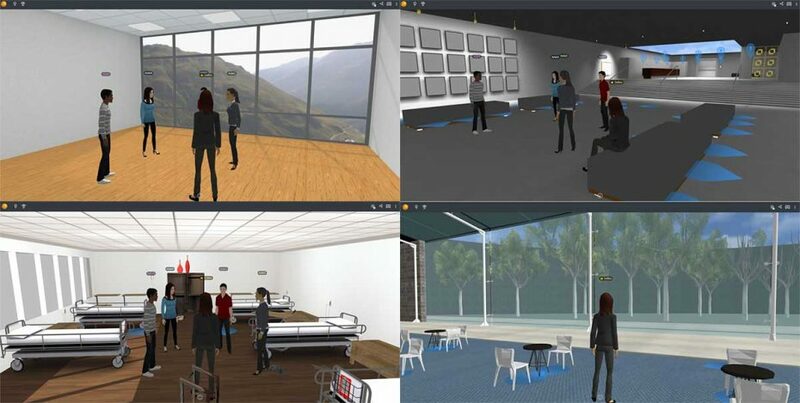 The immersive environment of VR Scenario makes it possible to create training simulations we could only dream of using traditional e-learning software. The immersive experience allows learners to make mistakes and learn from them in a safe environment. This experience is perfect for training first responders, teaching workplace safety, or offering interactive task tutorials. 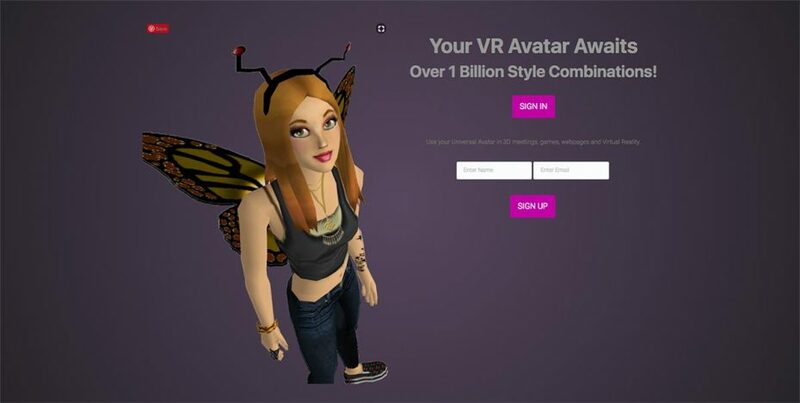 So much of the virtual reality creation process is fun, like creating avatars and searching for 3D objects, that it is easy to lose track of your intended purpose. Before jumping in, I recommend starting with a script outline that includes dialogue nodes, actor profiles, learning objectives, a rough sketch of your space with items, and a general idea of how players and actors move around your space. This should help you from getting sucked too deep down those virtual rabbit holes. I was pleasantly surprised to discover just how “ready for prime time” virtual reality learning really is. I highly recommend giving it a try. Your learners will thank you, and you will have a blast! Deltina Hay is the Director of Elearning Development at Elearning Delta. Elearning Delta specializes in custom course creation and innovative learning solutions. Deltina is the author of three books and over 20 online courses, and is a regular contributor to many industry publications. Millennials in the workplace, are you ready? VR Ready E-Learning Solutions, Improve The Way YOU Train!